Did you know that the internet is non-existent or subpar in many parts of the globe? And in some places, people cannot afford what is already available. In the year 2011, when Project Loon started, only 2.2 billion people could access the internet. In the year 2015, the number had risen to around 3.2 billion. Despite the rapid increase, around 4 billion individuals have no internet access. And moreover, the people with access have no quality or high-speed uninterrupted internet. Project loon allows connection from the sky and provides services in the areas where issues like mountainous terrain exist and where internet infrastructure has not reached. Balloon networks are far cheaper and easier to unleash in the remote places, including most developing countries, than putting up phone towers, laying wires or using the expensive communication satellites. Google balloons networks are also useful in emergencies. For example, people can use them as internet services back-up in case of natural disasters that damage ground equipment. Many cellular networks from different countries have also shown interest in renting Google Loon Networks access. That may enable them to reach more customers and offer quality uninterruptible internet in the hard to reach areas. Even though that might not be cheap, there is hope that they will be able to pass a percentage of the costs to their customers in form of lower price. Some of the companies that have already partnered with Google include Telstra in Australia, Vodafone in New Zealand and Telebras in Brazil – the partnership was for testing purposes. 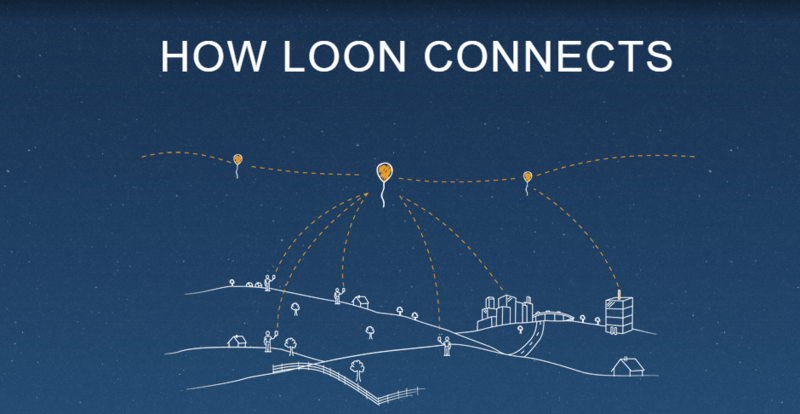 Google named it the Project Loon partially because it sounds looney and involves balloons. The balloons are super pressure envelopes meaning that they maintain constant pressure in altering temperatures made from three millimetre thick polyethylene plastic sheets. The balloons are partially inflated with helium to launch. When in the stratosphere, the balloons swell to full size. The balloons have a diameter of 15 meters and 12 meters tall. They can withstand temperatures around 117 degrees Celsius. On average, they remain afloat for 100 days – which means that they can rotate around the globe three times. After that, the engineers bring them down for maintenance. The balloons also boast a solar panel that powers the electronics during the day and charges the battery for the night usage. The flight box in the electronics box has navigational algorithms, altitude control system, a battery, radios and antennas to receive and relay 4G LTE signals. For the balloons to work, the regional telecoms have to beam 4G LTE signals to them. Every balloon communicates with many others to make a mesh-like global network that is always in motion. Also, the balloons act like cell towers to relay signals to the ground. The download speeds can reach up to 10 megabits per second – which is the United States national average. Earlier Google had tested a Wi-Fi concept which they abandoned mainly because they would have to build a ground based antenna network. With the 4G LTE, individuals in the remote areas can access internet and emails on their cell phones. The wind in stratospheric layers moves in varying directions – but which are predicable. Possible to steer the balloons either east, west, south or north, Google’s ground engineers shift the balloons either down or up through the layers. To lower them, they trigger the on-board pumps to draw more air in, which is around 7 times denser than helium. To raise them, they release the air. They also use the National Oceanic and Atmospheric Administration wind-prediction data to ensure that the balloons remain in the currents that can take them to where they are needed. With the Project Loon, many people will remain connected to the internet and therefore access a large portion of what the World Wide Web offers. Any business can gain more sources of products and materials and also access vital information at any time. People living in areas with inadequate health facilities can benefit from virtual medical care. Students can also read books from online libraries. In the year 2008, Google decided to acquire or contract Space Data Corp, a company that uses balloons to carry small base stations around 32 kilometres in the air to provide connectivity to oil companies and truckers around the Southern United Sates. However, all its attempts failed. Unofficial development on the Loon Project started in the year 2011 in Google X. Google ran several trials in the Central Valley of California. Later in June 14, 2017, they announced that the Project Loon was one of their projects. Google’s first pilot experiment on the Project Loon started on 16th June 2013 in New Zealand where they worked with the Civil Aviation Authority from Tekapo area to launch around 30 balloons in the South Island. Around 50 locals within the Canterbury Region and Christchurch tested the aerial network connections using special antennas. After the debut trial, Google worked to send 300 balloons in different places around the globe at the 40th parallel south which provided coverage to Chile, Australia, New Zealand and Argentina. Google is now planning to have thousands of balloons in the stratosphere. In May 2014, Astro Teller, Google X’s laboratory director, announced that they would not negotiate a section of bandwidth that was free for them throughout the word. Instead, they would become a temporary base station that mobile operators could lease. Google tested a balloon-powered internet access embark in Piaui, Braxil to mark the first LTE experiments and to launch closer to the equator. In February 2014, they released a statement that showed that a Project Loon balloon could last for 50 days in the stratosphere. By November 2014, the record time had increased to 130 days. In March 2015, the record time stood at 187 days. The aim of introducing the Project Loon was to enhance web’s influence on the world’s population by ensuring that everyone can access the internet. Project Loon is a real boon for most communities. Google also makes a large portion of its revenue from online services and ads and therefore getting all people online will highly benefit them. They are also payments for the Loon’s access.